In the world of contemporary R&B, Terisa Griffin is a complete anomaly: A singer who has developed an impressive audience not by traveling the road of so many adult soul singers who awkwardly embrace hip-hop to "stay relevant," but rather by immersing her listeners in classic soul history through rich instrumentation, church-inspired vocals, and an intentional sense of glamor that is reminiscent of the most beloved vocalists of the past half century. And Griffin does it not with gimmicks, but with the complete authenticity of an artist who has the whole package, beginning with that voice. Though she spent years working as a background singer for Diana Ross, Jerry Butler and others, it was less than a decade ago that Griffin moved forward 20 feet and took center stage with My Naked Soul, an album that showed her to be vocalist equal to the stars she had supported for so long. By the time of her 2011 follow up disc, Soulzophrenic (Personalities of Soul), Griffin had also developed into a solid songwriter, releasing a collection that made many end of year "best of lists" (including ours). She then expanded her audience the next year with several jaw-dropping performances as a contestant on NBC's The Voice. What was most encouraging was that each career move was also marked by notable artistic development, with Griffin appearing more and more assured as complete performer. While Terisa Griffin's consistent artistic growth over the past several years was noticeable, few could have anticipated the large creative leap forward that is represented by her latest album, Revival Of Soul. With it, Griffin moves into territory occupied by few of her peers, with a vocal performance that, by its virtuosity, places her among the kind of classic soul greats whose names are often spoken in hushed tones. She is that good. For me, the story of Revival of Soul begins on Track 5, where Griffin audaciously takes on Aretha's "Oh Me Oh My (I'm a Fool For You)," and makes it her own. The song opens with a gentle, jazzy piano, as Griffin's whispery vocals weave a spell around the arrangement. The track then builds with increasingly full instrumentation and background harmonies for four minutes, ultimately leading to Griffin's drop-the-mic crescendo, a breathtaking ending to a terrific interpretation. With that somewhat lesser known cover behind her, Griffin takes on a more familiar one: Marvin Gaye's "Distant Lover" is a difficult number to tackle, but a lonely saxophone solo combined with Griffin's fearless vamping make it a tour de force, and far more than just another remake. What really separates Revival of Soul from Terisa Griffin's previous work is not the cover songs, but rather the batch of compositions she has brought to the album. "Tonight Is The Night" has a classic Philly soul sound, and is the obvious first single from the album -- though, for my money, the earworm ballad "Naked" is a close second. These songs are representative of Griffin's noticeably sharper writing this time around, with hooks that go on for days. There simply isn't a bad cut in the bunch, though a few ("Save Me," "Swimming Higher," "Talking About Love" and the aforementioned "Naked" and "Tonight Is The Night") are strong enough to become instant staples on Quiet Storm radio. 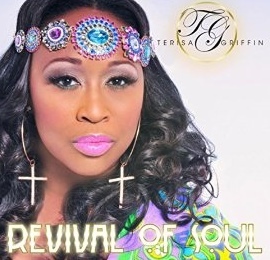 By the time the disc gets to its closing song, "Revival of My Soul," a touching tribute to victims of domestic violence, it becomes clear that Terisa Griffin has delivered a career album; a timeless disc filled with songs, production and vocals that can stand toe to toe with albums by Phyllis, Anita and Chaka of three decades ago. But, as with anything Griffin touches, it is collection full of the kind of personality and attitude that keeps it from being simply a museum piece to be revered from afar. Revival of Soul demands to be listened to and enjoyed now. It is one of the "must have" albums of 2015, and an incredible re-introduction of this talented artist to the soul music world. Highly Recommended.